REVIEW: HUM SAB ULLU HAIN IS THE WORST FILM EVER! Hum Sab Ullu Hain is a brutal assault on the senses, rants Nishi Tiwari. Think of the lousiest movie you've ever watched, and multiply it by 100. It would equal to Hum Sab Ullu Hain. It’s quite telling when you go in a movie with zero expectations and still come out exasperated, with a sense of having your senses violated in the most unprecedented way. To say that the film incorporates predictable comedy tropes and characters to justify its runtime would be putting it mildly. I would know where to begin summarising the story if there was any. 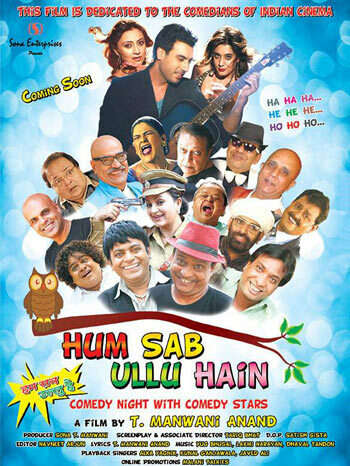 Hum Sab Ullu Hain starts off as a commentary on Mumbai’s resilient spirit because obviously we haven’t had enough odes to that already, which is quickly (and conveniently) abandoned to make way for atmospheric scares, gags, bumbling buffoonery with a new character being introduced every five minutes. Remember the time when Salman Khan-starrer Jai Ho was sniggered at for being crowded with too many has-been actors? Well, this movie stars Gavie Chahal, Rajesh Puri, Upasana Singh (of Comedy Nights With Kapil fame), Guddi Maruti (in a comeback after nine years), Vishnu Sharma, Sunil Pal and Dinesh Hingoo. Their collective acting prowess will make Kamaal R Khan and Mahaakshay seem like method actors. Ninety per cent of the film takes place in an abandoned bungalow, which just happens to be empty and unlocked, where a bunch of people stranded in torrential Mumbai rains seek refuge in. What follows is a royal mess, which would pretty much be your state should you decide to watch this cautionary tale of a film. C-grade film producer Chinappa is the first one to break into the house with his assistant Champu, followed by a Sindhi builder (because the film’s director T Manwani Anand is one) and his broker, a top actress who Chinappa has been chasing to sign for his next with her assistant (who is obviously gay and pounces indiscriminately on all men, equality yay!). Then enters a top hero who, with frazzled hair and clumsy jacket, looks more like current day Rahul Roy than a star, followed by a politician, a share broker, a runaway couple and the writer who is shadowing them for his next book, among others. Suddenly not sure if mindless movie or Bigg Boss house, right? The ‘ensemble’ cast then nosedives (if that’s possible at this point) into a comedy of errors of sorts, which errs on too many counts for an average movie-goer’s liking. For once, I’ll give myself two stars for making it through this unmitigated disaster.